Effect: The performer shows a small medium and long rope, then instantly has three equal lengths. He converst that back to small medium and long. Then slowly stretches the ropes again. Restores it. Then makes all ropes equal lengths and shows them separately. Then he makes three rope loops and links and unlinks them. 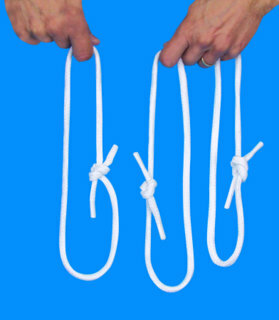 Gets rid of one rope, and then converts 2 ropes back to three. Finally restoring the three equal ropes back to uneven lengths. "I received the "Dances With Ropes" DVD in yesterday's mail and immediately started to watch. Ian offers some "out-of-the-box" thinking and has developed handlings for Professor's Nightmare that are superb and will fry anyone who sees you perform. Ian is clear and thorough in his explanations, taking extra time to discuss several subtleties which add polish to the performance. You also receive a set of linking ropes and routine, allowing you to smoothly transition from Professor's Nightmare to the linking ropes, and back to Professor's Nightmare for a remarkably magical performance. Magic Ian passed away on July 4, 2013. Unfortunately, we can fulfill any more orders at this time.